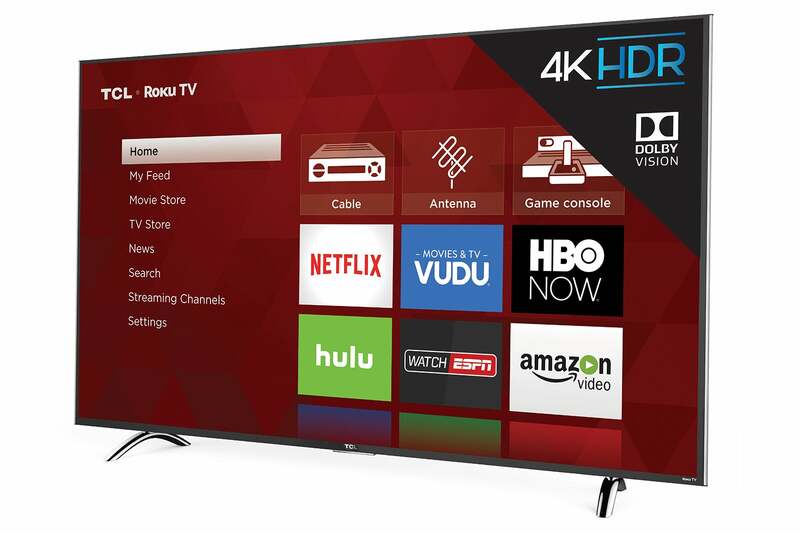 No entertainer likes to hit the stage on the heels of an act that killed, but such was the fate of TCL’s 55-inch 55P607 Roku-powered smart TV. It arrived at our lab on the heels of our hands-on time with the extraordinary Sony A1E OLED and Samsung Q9F QLED. That’s life. But those are $6,000 TVs that not a lot of people can afford. The 55P607 is a mere $650 and gives you a decent percentage of the high dynamic range (HDR) experience those TVs offer—including Dolby Vision, something Samsung’s Q9F lacks. And HDR is an experience you’re going to want. Indeed, if it delivered smoother motion, TCL’s 55P607 would’ve given the high-priced sets a tussle. 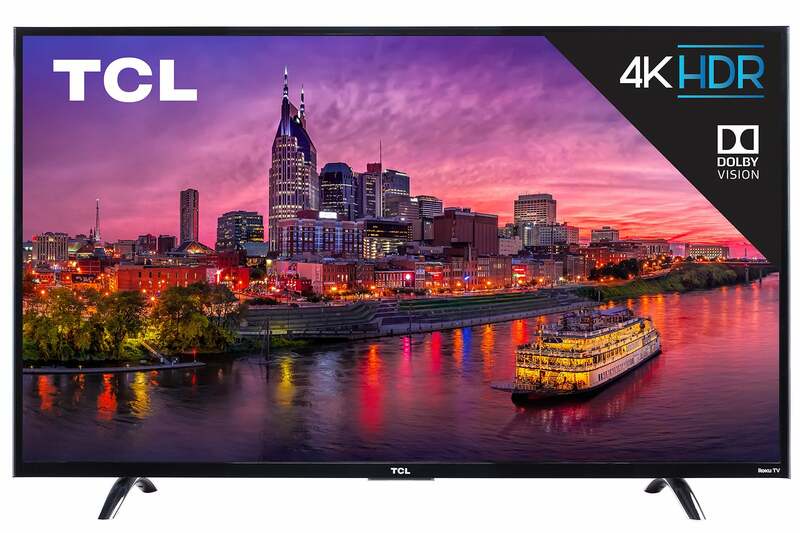 The 33-pound, 54.6-inch, 4K UHD (3840 x 2160 resolution) TCL 55P607 utilizes a straightforward, thin-bezel design: Thin at the top and thicker below, where the electronics reside. 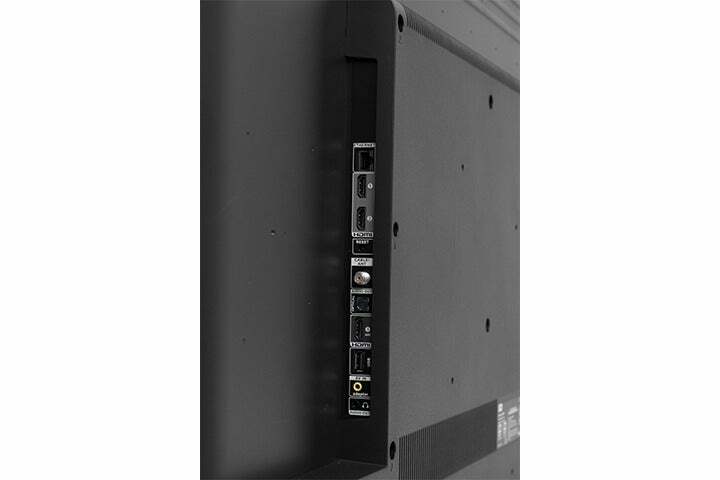 The ports are in a recessed alcove on the right side (looking at the TV) and include one USB, one coax, one ethernet, and three HDMI 2.0a with HDCP 2.2 (as required for protected Ultra Blu-ray movies). The only connector on the left side of the equipment bay is for the AC cord. There’s also an 802.11ac adapter onboard if you’d rather connect to the internet (and you must for setup) wirelessly. The P-Series are a standard design, but also 10-bit panels that support Dolby Vision. The feet for stabilizing the TV on flat surfaces are easy to attach, and wide enough to ward off most mishaps, though we prefer Samsung’s new better-safe-than-sorry super-wide feet. The whole deal is light enough that one reasonably fit person can un-box and set up the unit. While nothing fancy, and not universal (it controls only the TV), the 55P607’s remote is efficient. There are volume and mute buttons are on the right side of the remote, and a jack for the included earbuds on the left side. The whole deal is super easy once you’re used to it, though we would’ve liked the back button better if it had been located below the four-way cursor button. On-screen user interface is an area where TCL plays backseat to no one, thanks largely to Roku, though TCL’s own pop-up settings interface is also well done. We loved the fact that nearly all the settings are on the first level. Scroll up or down to the setting you want and adjust with the right or left buttons. Most interfaces require continually drilling down into sub-menus. On the other hand, we’re not big fans of having to log on to a website from another device to enter codes and set up a Roku account. At least you can skip the credit card info if you don’t intend to view pay content. Beyond that, setup is relatively painless. While the TCL doesn’t automatically recognize attached devices, it does preview what the device attached to the currently selected HDMI input is playing. Choose from a list of popular device types (DVD player, Xbox, etc.) and voila! Input named. Once you’re done with the configuring the 55P607, browsing the Roku interface is simple and of course, it being Roku, there’s tons of streaming content available. Quite a bit of which must be paid for, hence the credit card routine. What some might not like is that the advanced settings are all on the Roku app you install on your phone. There you can change the color temperature, gamma, and there’s an 11-point white balance grid. That could keep you tweaking for a while. But really, not everyone is cell-phone centric—put the settings on the TV TCL, please. The 55P607 is an average TV until you play HDR content. That’s when you can see why it costs a couple hundred dollars more than entry-level sets. Until we got to the HDR content, the picture of our 55P607 was strictly that which we expect from a mid-range LED-backlit LCD: Decent, if not overly rich color; greens skewed slightly to the lime; reds ever so slightly to the pink; an overall bluish/cool tint compared to quantum dot and OLED models. But most people don’t notice the color palette once the movie is on. They might, however, notice the 55P607’s slight jumpiness displaying large, highly detailed pan shots and action sequences. It’s not worse than what you’ll wee on most TVs in its price range, but the defects were noticeable, and they were significantly worse with 24 frames-per-second content played from a USB stick. Via HDMI, the motion artifacts were livable, and shouldn’t bother most users. Details were a tad fuzzier on the P-Series than with the $6,000 Samsung Q9F it was sitting beside. But again, the price difference makes that a rather unfair comparison. It was noticeable when different elements of the 72-zone LED backlight array turned on and off during our stress tests. Moire was also an occasional issue as well. But again, this is a $650 TV and the backlight issue will rarely be observed with normal content. Note that this all improved over our time with the TV via updates, so some of this is fixable. TCL seems hard at work in that regard. 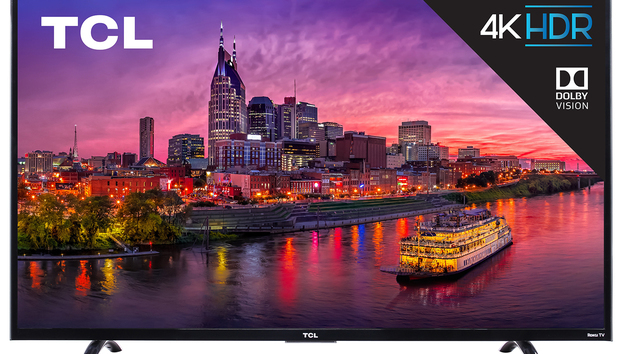 The TCL's 2017 P-series TVs are outfitted with one USB, one coax, one ethernet, and three HDMI 2.0a with HDCP 2.2. Where the P-Series distances itself from the like-priced competition is in brightness and support for both HDR-10 and Dolby Vision. We measured 430 nits of luminance with SDR (standard dynamic range) content and 600 nits with HDR-10 material. 600 nits isn’t amazing—it’s about 100 nits less than Sony’s E-series—but it’s enough to suitably emphasize the bright areas in HDR material. This was especially with Dolby Vision content, which can change the color palette on the fly to bring out details in dark and light areas. The P-Series are 10-bit panels, meaning they’re capable of rendering just over a billion colors. To encapsulate all that: we were satisfied with the P-Series picture with SDR content given the price, though we feel TCL could to a better job with motion compensation; and we were quite happy with the HDR. HDR doesn’t pop to the extent it does with higher-end TVs, but it’s a definite upgrade in the viewing experience you normally get from a $650 TV. The media playback apps were quite capable, if not the best we’ve seen. The video app will play back the new Dolby files and most AVC and HEVC files, and the audio app handles FLAC, OGG, and Apple lossless in addition to MP3, WMA, and M4A. Our only caveat is that the TV wouldn't recognize our 512GB USB drives, which left us copying stuff to smaller USB sticks. On the other hand, any USB stick greater than 16GB can be used as storage for the TV’s OTA (over the air) pause function. That’s a very nice perquisite. TCL’s P-Series has a great interface and enough picture chops to actually do HDR justice. And, it’s by far the cheapest way into Dolby Vision and HDR-10 that we’re aware of. For $650? Pretty sweet.